Very few are aware that the stock market crash of 2008, which officially began with the collapse of Lehman Brothers, was a perfectly controlled demolition of the Global Economic & Financial System. The back story is rather long and complicated but the following narrative nicely delineates all the key bullet points of what began the engineered Great Recession. The preceding link is essential reading for anyone looking to understand what is soon to transpire throughout the Global Economic & Financial System (GE&FS) in 2016. There is one major difference between now and 2008. The whole GE&FS is in much more dire shape than it was 8 years ago. That’s because there were no serious efforts to fix any of the systemic problems; nor was there any sincere intention to address the root causes of the continuing Great Recession. As a result, the now infamous can was kicked down the road for 8 more years. All of the financial destruction and economic downturns since 2007 have been meticulously engineered. Now there will be a replay of 2008/2009, except that the effects will be far more severe this time around because of the massive derivative exposure that many of the TBTF banks have since taken on. There are many other factors which will make 2008 look like a kindergarten party by comparison. The fact that debt — in all of its various forms — has ballooned to levels never seen on this planet is a HUGE contributing factor to the coming collapse. Sovereign debt, national debt, corporate debt, credit card debt, school loan debt, etc. are all at record highs and increasing by the day. The previous quote is an apt description of the current state of the GE&FS. Because it is accurately descriptive of the global predicament, there is no place on Earth that will be spared from experiencing the fallout of what is essentially the world’s first controlled demolition by way a derivative neutron bomb. That unparalleled demolition will be triggered by an event (read: detonation) not too unlike the Lehman Brothers bankruptcy in 2008, the largest in US history ($613 billion debt load). 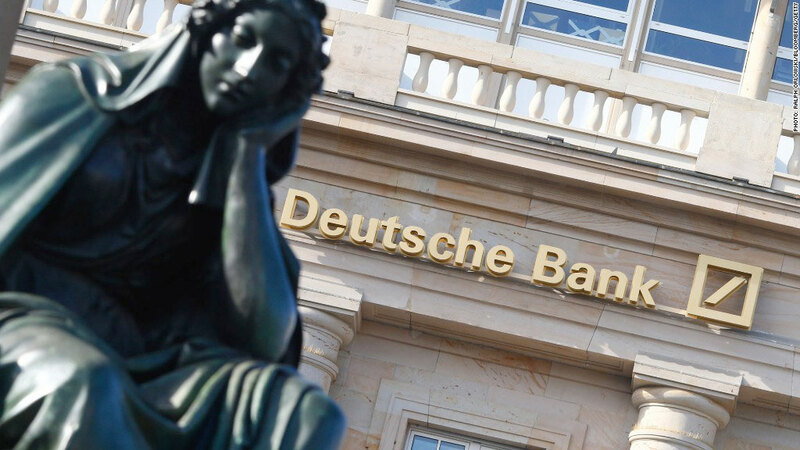 Deutsche Bank: Too Big To Fail … Or Not? This time the detonation will be provided by Deutsche Bank. In this way there is now a great likelihood that the European banking system will be destroyed by Germany’s failure to act decisively and in a timely manner to bail out the bank. Deutsche Bank shares have been in a free-fall collapse and there is no will to stop it. The German government under Chancellor Angela Merkel has been the most negligent and irresponsible in modern history. This inconvenient fact does not bode well for Deutsche Bank at this late date, as the warning signs of its collapse have been intensifying for some time now. Clearly Deutsche Bank was identified by the international banking cartel as the one they would sacrifice to write off volumes of bad debt. Lehman was sacrificed in 2008 for similar reasons. The controllers of this demolition need adequate cover to carry out a whole host of various schemes in which to quickly fleece the people of their assets and estates. The GE&FS is in such dire straits that this is their last-ditch effort to pull out any value they can before they pull the plug for good. Everything points to this October regarding the execution of the controlled demolition. Deutsche Bank could be brought down as soon as Monday, October 3. There are a number of reasons why this October promises to be a momentous month. Monday happens to be the very last day of the Biblical Shemitah Jubilee. It is followed by the Hebrew month of Tishri, the traditional month of stock market crashes, bond market blowouts, economic recessions and depressions, as well as other similar dramatic events (like 9/11). Quite coincidentally, the month of Tishri begins on Monday, October rd and ends on Monday, October 31st. Hence, the entire month of October will be full of surprises. They will likely come in rapid succession just like they did from September 15 through October 31st of 2008. That month and a half period saw the market crash repeatedly until the Congress agreed to fund the first major bank bailout of its kind. The Congress was blackmailed into such an agreement by the banksters who staged the whole affair that started with the Lehman collapse. The FED, Bank of England and other Central Banks were all in on the worldwide scam which saw an unparalleled redistribution of wealth from the middle class to the wealthiest in America and beyond. This time around the planned grand theft will be on an order of magnitude way beyond that of the 2008 heist. This time the banksters are going after everything that is not nailed down. At the end of the day, every pension plan and 401k, IRA and KEOGH plan, savings and checking account, mutual fund and money market, precious metal holdings and commodity account, insurance policy and annuity will be targeted by the avaricious banksters. They all know the whole place is going down after Deutsche Bank collapses and they intend to acquire whatever they can while there are still assets to be stolen. What are the telltale signs of a manufactured banking collapse? The US Department of Justice recently levied a $14 billion fine against Deutsche Bank at a point of vulnerability that could not have had worse timing. This single act of corporate sabotage is one that the USA had quite purposefully executed in order to further advance their plan to throw Europe into chaos. Europe must be sacrificed if the US dollar is to maintain any semblance of its status as the world reserve currency. The successful BREXIT referendum was another example of the will to destroy the European Union (EU) by the moneychangers who operate behind the scenes. There is no question that the deliberately timed $14 billion fine was aimed at further weakening an already teetering banking behemoth. As the largest bank in Germany, a bankruptcy of this size would reverberate throughout the entire German economy, the EU, and beyond. It will all begin with Deutsche Bank and then with some other shaky institutions that have been in precarious condition for much of 2016 and 2015. The following headlines illustrate how the MSM is being used to get the global audience ready for the Deutsche Bank bankruptcy. As was previously stated, the world will soon witness the controlled demolition of the whole Global Economic & Financial System. There are very good reasons why such an eventuality must and will take place. Only by understanding who really controls the levers of financial power and pushes the buttons of economic progress can the true back story be known. Is Glencore Being Set Up As The Next Lehman Brothers?